Here is something I’d like to share to everyone what I have learnt from my Masters of Business Administration degree. It’s about our People and Organisational culture. I have often gone to seminars that talk about incentivising your staff for financial targets. I have done it their way, but often found the ‘oomph’ runs out in a few months. Often we assume incentives are important to motivate your staff, but actually published research shows that it decreases productivity and can make one narrow-visioned. The higher the incentive, the lower the productivity and the meaner people can get (Piff et al.)! This is same for developing and developed nations (Ariely et al.). No difference. 1. Appreciation on a routine basis – establish a great culture. – Culture eats any business strategy for breakfast! 2. Career progression opportunities- this can be in either furthering skills or job roles. Where do they want to be? How can you help them get there? – Establish a skills list for each job role and review the next desired skill for career progression! 3. Work-life balance, via job share and flexibility – the most valued of all benefits and most challenging to provide in dentistry! – Give your staff multi-varied roles so they can job share on a daily basis. If you can instill a small step toward any of the 3 points above, you will have highly engaged team. One that doesn’t need monetary incentives to beat all targets. Of course rewards help but they shouldn’t drive Motivation. If you are to introduce an incentive, you need to involve your team – what would they love to have as a bonus or reward? Ask your team in a group meeting. You will be surprised how many times it’s not money they will ask for. Most of them will ask for positive culture and work-life balance! CCC Smiles Orthodontist Sydney – in my orthodontic practice Clean Clear & Correct Smiles (www.cccsmiles.com.au) and business we have KPIs, but our KPIs are not just about revenue and profits, it’s also for customer satisfaction, sustainability, care for the planet and community networking. Each staff member chooses the KPIs that best suit their role and skill set. They track and report this in team meetings every month. If a staff member gets 75% of all their annual KPIs then they get a ‘mastering a skill’ bonus of upto certain $. They can choose to spend that on personal or professional development – eg. gym membership, piano lesson or conference. Do we meet targets? Yes! We do and with high employee engagement and job satisfaction. How do I know this? I conduct surveys of my team engagement. I’m a firm believer of involving people in decisions that affect them. Some people think conference and travel is a job incentive. Taking your staff for a conference is great. But maybe it’s not what they want. 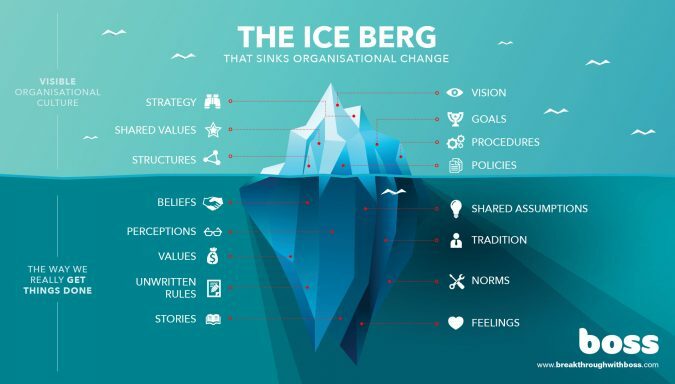 The iceberg analogy above shows how culture is way bigger than business strategy and so much more powerful that it can sink a whole ship if not developed in a business. Specialist Orthodontist, Enterpreuner, Author, Researcher and Speaker.